“A solar panel”, says Pablo Cotarelo, “is a way to redistribute wealth”. The energy analyst is sitting in the little courtyard of Rosa de Foc, a social centre in Barcelona. Inside, members of the food co-op are collecting their weekly fruit and veg; here in the yard a group of activists from the UK are listening to Cotarelo describe the ‘energy revolution’ planned for the city. They’ve come over on a social movement ‘tour’ with Global Justice Now, a group which campaigns against poverty and injustice and pushes for democratic ownership of resources. “We are trying to establish a kind of co-operative with state ownership – a ‘public citizen’ company. It’s a very new proposal, not tried before in Spain”, explains Cotarelo. 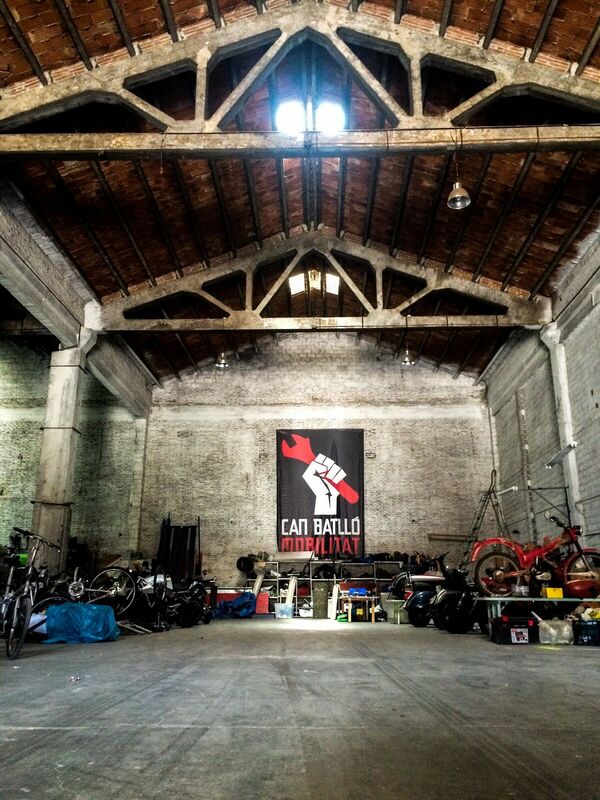 The radical plan is made possible by the takeover of City Hall by ‘citizen’s platform’ Barcelona En Comu last year. De-privatising water and energy is high on the agenda. The aim is not just to make energy cheaper, but to change the way energy is produced: moving to renewables on a massive scale. The model in place is Som Energia, a member’s co-op which both produces and supplies electricity. 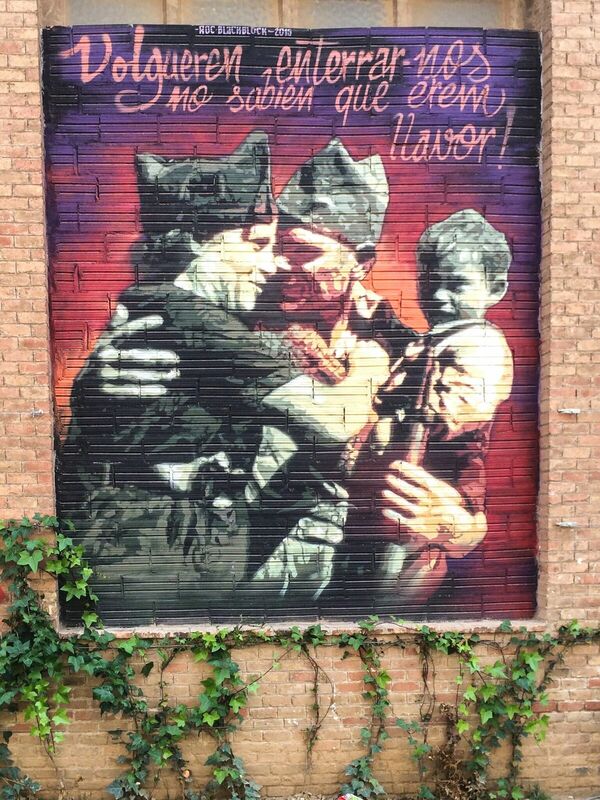 It is very much a social movement; started in Girona but now spreading to towns across Spain. 24,000 members have now joined up, and each has the right to participate in decision-making assemblies, which are live-streamed. In a city where only a tiny fraction of its energy is renewable and flats are generally single-glazed, and in a state where five companies control more than 90 per cent of the energy market, Cotarelo admits that transforming the energy supply is “a big struggle”. But the plan he is working on, with support of the new city council, would see the poorest in society given grants for their own solar panels, and insulation and double-glazing rolled out across Barcelona to improve efficiency. By the time the discussion finishes, members of the food distribution co-op are holding their assembly inside the Rosa de Foc social centre. The name is taken from a nickname given to the city by journalists covering the social revolution and civil war in the 1930s – it translates as ‘Pink Fire’. Offering healthy local food for members drew a diverse crowd who weren’t necessarily activists, but just people in the Gracia neighbourhood who wanted better food. It was the self-organising, anarchist history of the city which got the project off the ground, according to Fresnillo – plus the communal summer meals held outdoors. This produces a wistful look among the UK activists; balmy nights and cafe culture is not something easily recreated in Britain. The co-op (which legally is an NGO) provides local food to a network of forty families. Membership is contingent on a work commitment and regular attendance at meetings; you can help out in the shop or turn your hand at accounts, but someone from the household has to be there for a minimum of two hours a month. Barcelona’s radical new city council has stated it aims to be the “capital of the solidarity economy”. It estimates that 8 per cent are employed in around 5,000 social enterprises: self-organised co-operatives supplying facilities, food, finance and energy which could form an alternative to the dysfunctional late capitalism that has shaped cities – especially Barcelona – in recent years. Ruben Suriñach, form the Catalan Solidarity Economy Network, explains what this means in practice: while the idea of social economy generally involves co-operatives and non-profits – established, ‘legitimate’ operations – the soldarity economy is more grassroots. It involves social movements, on the ground, which are “trying to define a new economic paradigm and challenge capitalism”, and which operate in a participatory, democratic way. The tradition of ‘associationism’ in Catalonia has helped this network develop, Suriñach explains. Anarchist self-organisation has, in part, defined this city, flourishing in the early 30s but suppressed by events of the brutal civil war and subsequent dictatorship. Now, people are converting “frustrations into possibilities”: creating their own finance models after neoliberal ones failed so badly; importing and distributing food without the ‘help’ of supermarkets. Through Suriñach’s organisation these models are being firmly entrenched; brought into local authority procurement and linked up to create a viable alternative in Barcelona. Squats and radical social centres fostering these kinds of ‘solidarity economy’ networks used to be numerous in Gracia, the picturesque neighbourhood which houses Rosa de Foc. But tourism and gentrification have driven these anarchic spaces out, replaced by hostels for drunk European teenagers, and higher-end hotels and stores. Not just the squats are gone, but the grocers, the nurseries, the public spaces. In the Sants neighbourhood though, Barcelona’s squatting history is very visible. Walking through the working-class neighbourhood you come across Can Vies, with its half-demolished outer wall and defiant graffitti. The occupants of this squat faced an eviction battle in 2014 which saw hundreds of riot police deployed, thirty people arrested, and angry protests in surrounding neighbourhoods, even in other cities. The defenders of Can Vies infamously torched the bulldozer which started demolishing the wall, and the government eventually gave up. 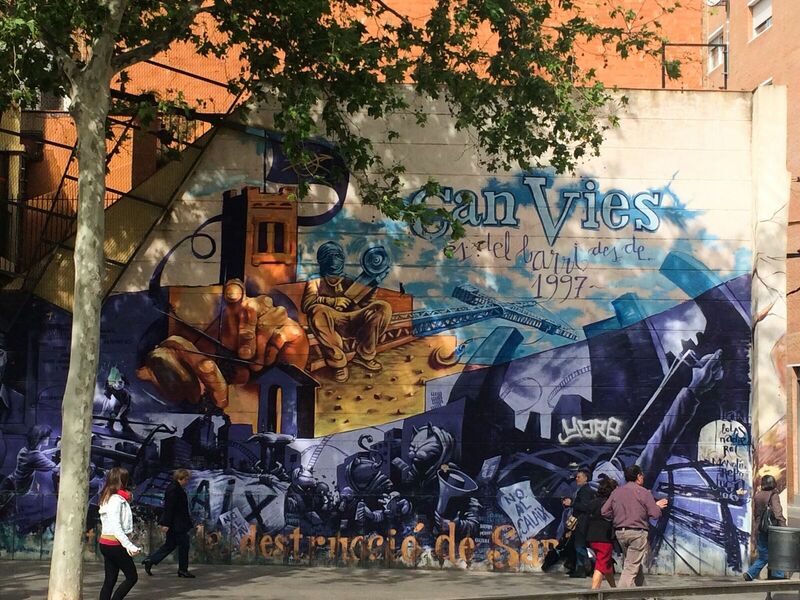 Can Vies’ continued existence is celebrated with a large mural opposite Sants metro station. But this social centre is dwarfed by its counterpart half a mile away. Can Batlló is a vast warehouse area, the size of eight football fields, which houses a huge array of workshops and social spaces. Local residents had already been quietly reclaiming the massive abandoned site, which had once been a textile factory, when flat developers turned up in the early 2000s, eyeing up the massive site. Thus began ‘Tic Tac for Can Batlló’ – the campaign to push the local authority into letting the community run the site for its own use. Threatening occupation, and presenting their plans for the buildings, the community were – eventually – successful. Joan Costa, who shows us around, describes the events of 2011 as a “perfect storm”. 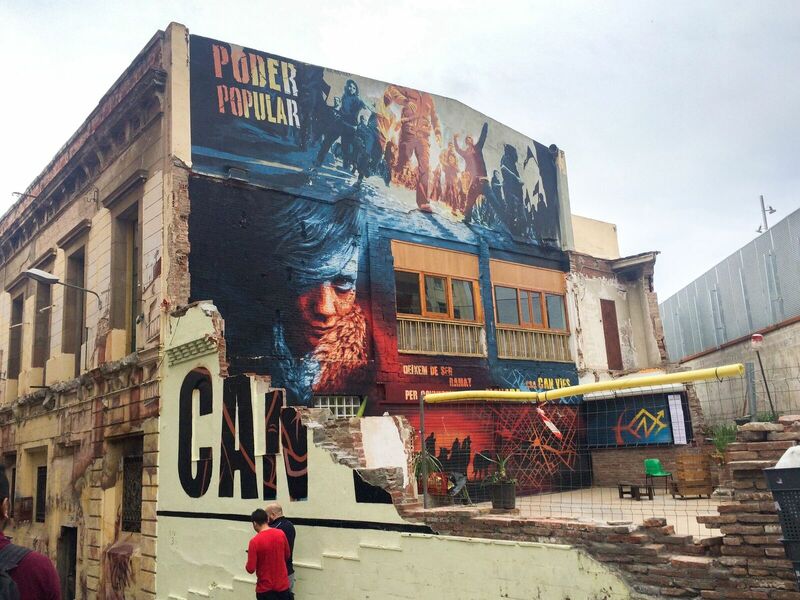 The energy of M15, the protest movement that swept through Spain, combined with a change in local government, and the determination to fight the gentrification transforming Barcelona into a playground for the rich, meant the fight for Can Batlló, as with Can Vies, had massive support across the city. “The first thing we did was cleaning, cleaning, cleaning”, chuckles Costa, remembering when they were finally handed the keys. “Then we set up a library. We stopped at 40,000 books.” Inside the airy library photographs of the occupation and protests line the walls. In one, hundreds of people are marching down a nearby street, carrying a huge 10-ft clenched fist and beating drums. The buildings are still owned by the council, but managed by the community. The aim, Costa says, is to “create political space as well as physical”. Over 300 people are actively involved in the non-hierarchical assembly-style meetings, with 30 working groups. “No one is getting paid, and no party politics are allowed”, Costa explains as he shows us the carpentry, metalwork, printing and autorepair workshops – each is huge, bustling, and notably neat. Some council grants and sales from the bar – which is located in the architect-designed social space – finance the project. But if taking over a warehouse complex sounds ambitious, how about a whole valley? In the foothills on the outskirts of Barcelona, a grand, dilapidated building overlooks neat rows of terraced gardens and allotments. The forested valley is just a mile or so from the city’s high rise blocks. This is Can Masdeu: social centre, community gardens, and home to around 25 people. It became famous in 2002 when the squatters resisted eviction, sparking solidarity marches and even embassy occupations far beyond Barcelona. The stalemate continues; the community is now well-established but is by no means secure and could in theory face eviction again. En Comu’s position in City Hall, with its anti-eviction activist mayor Ada Colau, means the residents can breathe easier, and are now hopeful of progress with the legal situation. As in Can Batlló, the social centre is crucial to Can Masdeu, with workshops bringing in visitors and the bar providing a crucial source of income. But outside the main building the community allotments are an equally important aspect. Claire, a resident of Can Masdeu originally from the UK, takes the group around the gardens, which are just starting to bloom. Some larger plots provide the residents with food, while smaller patches are run by non-residents; people from nearby neighbourhoods who come up to grow their veg. This means, explains Claire that it’s “not just young squatters – people in their 90s are part of this space too.” Previously the valley was closed to the public, and the Can Masdeu squatters wanted, from the start, to open it up to locals. Big ideas for the site – from an agroecology school, to squatting the larger, abandoned building – are discussed, but as with the parties and visiting groups, must be balanced with the need for it to be a stable, secure home for the many families that now live there. For social centres, squats and activist movements, having a local authority that is probably not going to try to evict you, shut you down or fine you is a gamechanger. En Comú – ‘In Common’ – is an electoral platform made up of a myriad of political parties and with even more mutations and sister parties across Spain. It won enough seats in the May 2015 local elections to govern in minority. While focusing mostly on city-specific issues like housing, tourism and nursery provision, this new city government is well-placed to take a stance on wider issues, such as the EU-US trade deal currently being negotiated. The Transatlantic Trade and Investment Partnership [TTIP] has mobilised hundreds of thousands of people across Europe and beyond, and it is in Barcelona, on the last day of the GJN’s trip, that several hundred such activists gather. 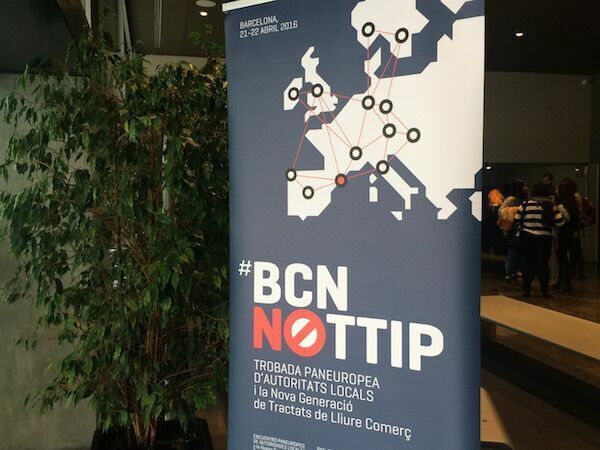 The city of Barcelona has now declared itself a ‘TTIP-Free Zone’, and at this two-day meeting it is joined by forty other cities and local authorities also opposed to the neoliberal trade deal. The ‘Barcelona Declaration’ is drawn up, demanding immediate suspension of the secretive negotiations. The whole event has been hosted by the city council; unthinkable under a different administration, and unthinkable too for some of the UK activists whose local authorities are more a source of council tax hassle than anything else. Kennedy Walker, who would be going back to London to campaign with radical electoral platform Take Back the City, said it was the participatory nature of Barcelona’s politics that really stuck with him. “Embedded in the politics of Barcelona are processes that involve radical democracy and participation – by people who haven’t been involved in politics before”, he said, with an enthusiasm matched by the whole group. Britain, they conceded, might not have the sunshine for open-air meetings, neighbourhood meals and year-round allotments, but the need for grassroots, effective radical change is just as pressing. Is it just as possible? “Rosa de foc” does not translate as pink fire, but as “fire rose”. And, as you can read in the article, that name fits well a nice and socially active city. Capitalism is a social mode of production. You don’t get Socialism by the techno-fix hack of sticking solar panels made on Chinese sweat shops on the roofs of fashionable Barcelona squats. Although it’s an appealing dream. Soon it will be yesterday’s fashion. Low wages aye , but not sweat shops producing SVP. Mostly roboticised , but the quality and longetivity varies across the manufacturers. Costing is an important part of going over to renewables , something that can drive down big banking over the longer term , but is in the process shifting that wealth to China , which ironically really needs a non carbon option in its cities. The other option , import from Germany? at 4 times the price , for at least double the longetivity. Catalonia is not the Summer sun Spain , so it will need more than just SVP , from wherever. From small acorns and all that. Really interesting and great to hear grass roots activism has been given a voice and gained in strength because of the newly elected politicians.